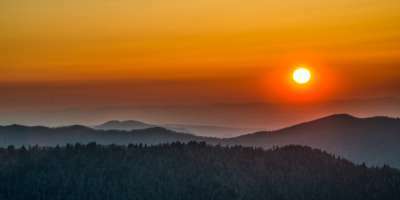 To walk in the Great Smoky Mountains National Park is to follow in the footsteps of the Cherokee Indians; living on this land for more than 14,000 years. Because of the great efforts of many, today the 520,000-acre Great Smoky Mountain National Park (GSMNP) is protected forever. 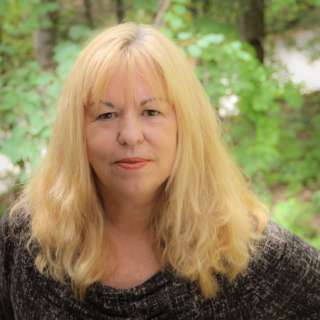 And today all of us can stand atop Clingman’s Dome and see the same endless blue view, fish for trout in the same clear streams and spot the same spring wildflowers as did the ancient Cherokee people. 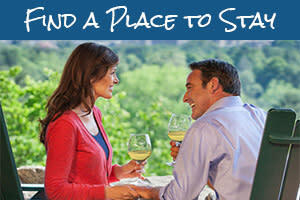 There are many ways to spend a day in the Park. To make the most of your day trip from Asheville, choose an adventure itinerary below that best speaks to the explorer in you. This gorgeous green valley (55 miles from Asheville) was once an early settlement of farmers before the GSMNP was formed. A visit to Cataloochee is like walking back into the early nineteenth century. Walk into the old school house and see the initials of the students carved into the desks. Picture folks dressed in their Sunday best as they enter Palmer Church in the 1890’s. Visit the well-preserved Palmer House and imagine the family huddled by the fire on a cold winter’s night. 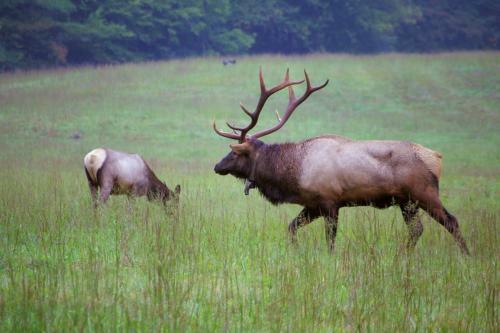 Where the Elk Roam Freely: In 2001, elk were released in Cataloochee as part of an experimental program to reintroduce elk to the Park. The herd can be seen regularly in the fields, especially in the early morning and evening hours. Keep your eyes open for other wildlife including white-tailed deer, black bears, butterflies and many species of birds. Hiking Through History: The Boogerman Trail is a 7-mile loop through groves of old-growth forest (a few stand more than 170 feet tall) crossing over one of the longest footbridges in the Park. The Little Cataloochee Trail is a 5.2-mile hike passing old log cabins, a church and a cemetery. This is a hike made for history buffs but there are some steep climbs. Trout Fishing: Cataloochee Creek and its tributaries have a healthy population of wild trout. Pick up fishing regulations at a park visitor center. 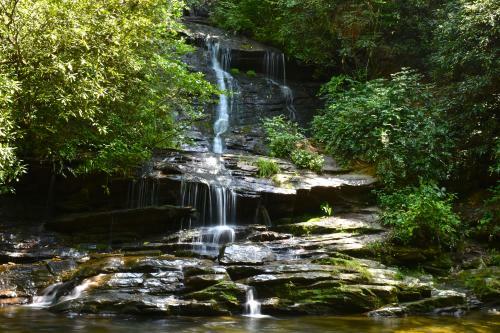 Hike to the Falls (Ken Burns’ favorites): An easy 1.6-mile roundtrip hike from this area near Bryson City, awards you with two beautiful waterfalls; the 60-foot high Tom Branch Falls and just a bit further, the 25-foot Indian Creek Falls. From the parking area follow the sign for the 80-foot Juney Whank Falls. Tubing – Lazy Cruise or Wild Ride? The Upper part of Deep Creek can be a bit on the wild side with bouncy white water action. The Lower Creek offers a gentle cruise down river. Both offer a chance to enjoy the swimming hole – perfect summer day! Fly Fishing: The Great Smoky Mountains National Park has about 2,900 miles of streams. Deep Creek is one of the best brown trout streams in the Park. Mountain Biking: This is one of the very few places in the Park where mountain biking is allowed. There are short in-and-out trails. If you are a serious rider, take a detour out of the Park 15 miles west of Bryson City to the world-class trails at Tsali Recreation Area. If The Great Smoky Mountains National Park has been on your “bucket list” for years and you want to hit all of the highlights in one day, then this trip is designed for you. But it also appeals to the masses so consider going during off-season months – September, November and April through early June. Begin your drive from Asheville to Cherokee, entering the Park’s Oconaluftee Visitors Center. If you are considering taking the Blue Ridge Parkway to Cherokee, save that for another day – you have a long drive ahead. First stop will be the iconic Clingmans Dome – about 80 miles from Asheville and the highest peak in the Smokies. At the halfway point you enter Tennessee at the Park’s Sugarlands Visitors Center, from here drive to Cades Cove. This lush valley with towering peaks is an 11-mile loop road, a great place to picnic before heading back to Asheville. Just outside the GSMNP in Bryson City, board a vintage train and see some of the most scenic areas of the Smoky Mountains via the Great Smoky Mountains Railroad. Fall is especially amazing with spectacular views of the forest’s brilliant colors. During the holiday season the train is magically transformed into the Polar Express (after the beloved children’s book and movie) and travels to a mythical North Pole where Santa is waiting. Your kids won’t forget the ride and neither will you. Plan for a full day and leave early. Bring jacket, water, lunch/snacks, wear good walking/hiking shoes. Make sure you have a full tank of gas before entering the Park. 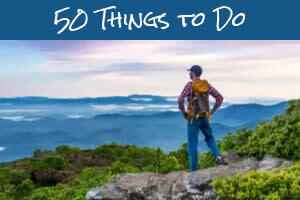 To learn more about other outdoor adventures in the Asheville area click HERE. Top photo by Jeremy Wilson. Waterfall photo by Jason Tarr.